A supernova (Plural: supernovas or supernovae) is the explosion of a star that occurs either at the end of its life or because it has accumulated too much mass from its companion star. In either case, the star suddenly increases dramatically in brightness because of a catastrophic explosion that ejects most of its mass. Supernovae are the largest explosions we know of that take place in the Universe. Supernovae are more commonly seen in other galaxies. They do exist in our galaxy (the Milky Way), but they are harder to observe because dust blocks our view. Over the last one thousand years, just three Milky Way events have been observed with the naked eye. However, many have been seen telescopically in other galaxies. By monitoring supernovae in other galaxies, scientists have calculated that they should occur on average about three times each century in the Milky Way. The last supernova to be observed in the Milky Way was in 1604 by Johannes Kepler (1571-1630), a German mathematician, astronomer, and astrologer. NASA’s Chandra telescope discovered the remains of another, more recent supernova which exploded in the Milky Way more than 100 years ago. 1. In a binary star system: where two stars circle around each other (orbit) around a shared mass, i.e. they orbit the same point. One of the stars, a white dwarf, steals matter from its companion star. Eventually the white dwarf has built up too much matter, which causes it to explode – a supernova occurs. 2. A single star: the supernova occurs at the end of this star’s life. As the nuclear fuel within the star runs out, some of its mass flows into its core. As more and more mass flows in, the core gets denser and denser. Eventually the core is so heavy that it is unable to withstand its own gravitational force, and collapses. 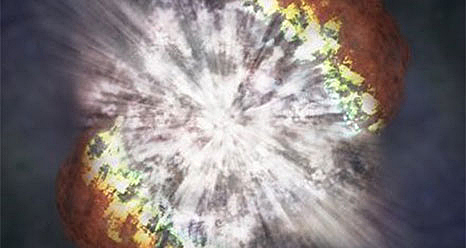 This results in a mega explosion – a supernova. Our Sun is a single star, but scientists say it will never become a supernova because it does not have enough mass. It was thanks to one kind of supernova that we now know that the Universe is expanding, and is growing at an accelerated (ever-increasing) rate. Scientists also discovered that supernovae are responsible for the distribution of many of the elements in the Universe. When the supernova (explosion) occurs, elements and debris are shot into space. Many of the elements that exist here on our planet were made in the core of stars. After a star explodes, these elements travel on to form most of what we see in the Universe, including planets and new stars. How do scientists search for Supernovas? Scientists use different kinds of telescopes to search for and study supernovae. While some telescopes observe the explosion’s visible light, others record data from gamma rays and X-rays that are also produced. NASA has two telescopes – The Hubble Space Telescope and Chandra X-ray Observatory – which have captured images of supernovae. You could search for supernovae! You do not need to be a super-scientist with fancy equipment to search for and observe a supernova. You don’t even need a telescope to hunt for them. According to NASA, a teenager discovered a supernova in 2008, then a 10-year-old girl in 2011 from Canada discovered a supernova while she was looking at night sky pictures on her computer. The photographs had been taken by an amateur astronomer. One of the images just happened to include a supernova. You never know – if you put your mind to it, you could find the next supernova! When a star explodes, it leaves behind a debris field of stellar material (star material) and high-energy particles known as supernova remnant. Scientists use the Chandra X-ray Observatory to study these remnants.